Quarterfinalists Determined at Vans US Open of Surfing | EasternSurf.com | All East Coast. All The Time. HUNTINGTON BEACH, California/ USA (Wednesday, August 2, 2017) – The Vans US Open of Surfing completed Rounds 3 and 4 today to determine the Quarterfinalists of the sixth stop on the World Surf League (WSL) Championship Tour (CT). Four-to-five foot+ (1.2 – 1.5 metre+) waves provided great conditions for the elite surfers on the southside of the Huntington Beach Pier. Following the women’s heats, the Men’s QS 10,000 continued with Heats 14 through 22 of Round 2. Local favorite Courtney Conlogue (USA) is heating up at the Vans US Open with her win over three-time WSL Champion Carissa Moore (USA) and Pauline Ado (FRA) in Round 3 Heat 4. Conlogue fired off a 5.83 on her opening exchange and continued to hold the lead with a 6.40. Conlogue will advance to the Quarterfinals and get one step closer to hunting down her first CT win in Huntington Beach. Moore went on to face Sage Erickson (USA) in elimination Round 4 Heat 3. The Californian wasted no time, scoring a 6.33 in the first few minutes of the heat. Moore battled back with two 4-point rides, but Erickson secured her win with a second 6.33. Moore, who is currently 8th on the Jeep Leaderboard, will leave this event with a 9th place finish. Erickson, World No. 9, will advance to the Quarterfinals for the fourth time this season. Earlier this morning, current World No. 2 Sally Fitzgibbons (AUS) flew through Round 3 with a 14.33 heat total against Erickson and Silvana Lima (BRA). Fitzgibbons took full advantage of the southside sets to post an excellent 8.00 and solid 6.33 for the win and the highest two-wave total of the women’s event today. Fitzgibbons will meet Erickson again in Quarterfinal 3. 2016 WSL Champion Tyler Wright (AUS) lost to Coco Ho (HAW) in her first heat today, but came back with a big win over wildcard Maud Le Car (FRA) in Round 4 Heat 2. Wright threw down a commanding 7.57 to gain the heat lead. Le Car, with a 4.67, needed an excellent 9.07 after Wright locked in a 6.17. 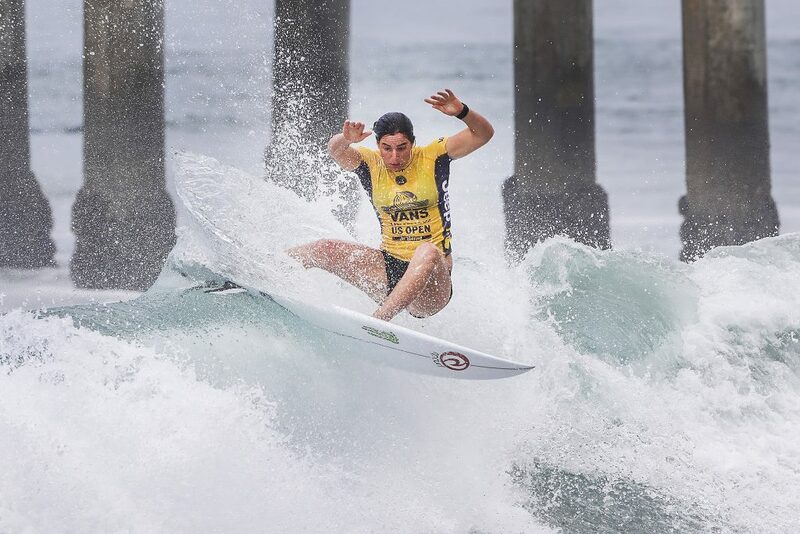 Le Car, who previously eliminated six-time WSL Champion Stephanie Gilmore (AUS), was not able to repeat her victory yesterday and will exit with in 9th place. The opening heat of Round 3 saw Johanne Defay (FRA), 2015 event winner, earn the first spot into the Quarterfinals after defeating Nikki Van Dijk (AUS) and wildcard Maud Le Car (FRA). After a few low-scoring attempts, Defay found her rhythm and garnered the top two scores of the heat. 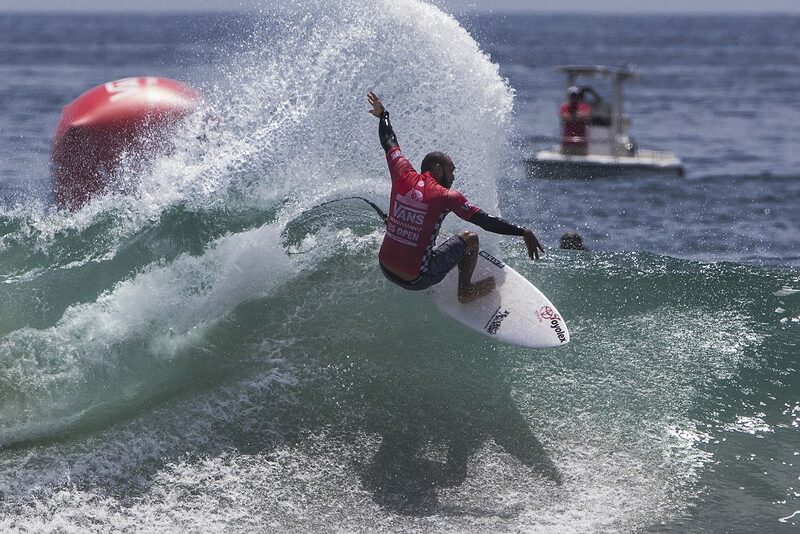 Defay is currently ranked 5th on the Jeep Leaderboard and will look to continue earn another win at the Vans US Open. In an extremely close head-to-head elimination heat, Tatiana Weston-Webb (HAW) narrowly got the advantage over Van Dijk. Weston-Webb received a 9.60 two-wave total to Van Dijk’s 8.73 to earn her spot the Quarterfinals. Weston-Webb’s victory today puts her in a great position to continue her hunt for a back-to-back event win. Van Dijk,who is currently ranked 6th, will leave with her second 9th place result in 2017. Coco Ho (HAW) advanced straight to the Quarterfinals after her big win against Wright and Weston-Webb. Wright got off to a quick start in Round 3 Heat 2 to take the lead with a 5.00, but Ho climbed back with just a 0.60-point lead. Wright had one final opportunity to close the gap on Ho, but fell just short. Ho will face Wright again in the Quarterfinals when competition resumes. Pauline Ado (FRA) and Silvana Lima (BRA) closed out the women’s competition today with Round 4 Heat 4. Ado kept an early lead and continued to better her situation, with an 8.80 two-wave total. The Brazilian veteran could not close the 1-point gap and will be eliminated in Round 4 for the second time this year. Ado’s win marks her first Quarterfinal berth of the season where she will have the chance to play spoiler when she comes up against Conlogue. The Vans US Open of Surfing Men’s QS 10,000 continued after the women’s action wrapped and upsets were in abundance throughout Round 2, Heats 14 through 22. South African Michael February (ZAF) got a dose of the CT at J-Bay and came out with a clutch performance to earn his way into Round 3 as CT rookie Ian Gouveia (BRA) was eliminated. February found himself in fourth place heading into the five-minute mark and got to work on his backhand to earn a 7.10 and get back into the heat. But, the 24-year-old wasn’t done yet and exploded through two more critical backhand attacks on a set wave that he finished off in the shorebreak, receiving a near-perfect 9.17 to complete his comeback run. QS veteran Carlos Munoz (CRI) came up with a big performance of his own over top seeded surfers, former CT competitor Keanu Asing (HAW) and 2017 standout Yago Dora (BRA). The Costa Rican lit up Huntington’s lineup, smashing bottom-to-top turn combinations to earn a 14.10 heat total. Munoz and Asing will continue through to the next round. Munoz comes into the Vans US Open of Surfing fresh off a win at the Surf Open Acapulco QS 1,000, his first-ever QS victory. Fellow Costa Rican Noe Mar McGonagle (CRI) and South African Beyrick de Vries (ZAF)continued the upsets by eliminating CT rookie Ezekiel Lau (HAW) and top seeded surfer Michael Rodrigues (BRA). Jadson Andre (BRA) stayed clear of an early exit by finding a classic Huntington Beach barrel that sling-shotted him out and through the pier pilings to finish off his 8.33 ride with forehand snaps. The CT competitor is in a slump at the elite level and now turns back to the QS for a spark and found just that in his opening heat. Griffin Colapinto (USA) continued that trend by advancing on, despite Miguel Pupo’s (BRA) early exit at the hands of former CT competitor Dusty Payne (HAW). Colapinto’s massive backside rock-n-roll floater on a bomb set him up for an inside finish that earned the San Clemente standout a 7.67 to begin his heat. At just 19-years-old, Colapinto is already a name known around the surfing world and is on his way to becoming a threat to some of the world’s best. The final heat of the day witnessed one last upset as CT rookie Leonardo Fioravanti (ITA) fell victim to an in-form Soli Bailey (AUS) and Marco Giorgi (URY). Top seeds Pat Gudauskas (USA), Mitch Crews (AUS) and Tomas Hermes (BRA) survived debut upsets alongside CT competitors Connor Coffin (USA), Caio Ibelli (BRA) and Italo Ferreira (BRA), who are also into Round 3. Vans US Open of Surfing Men’s QS10,000 action will recommence at 7:30 a.m. PDT with Round 2 Heat 23 before the Women’s CT Quarterfinal bouts get underway. Good run of waves on tap through the event window. Healthy long period S/SSE swell from the Southern Hemisphere peaks Wednesday, as leftover tropical swell and NW windswell fade. There’s a chance for showers/thunderstorms again on Wednesday as an upper level disturbance moves over the region. If that materializes expect some variability in what look to be generally light local winds, along with the potential for lightning. Surf eases Thursday, then a fun, reinforcing blend of SSW and S/SSE swells level size off through the final weekend of the event. Small NW windswell energy blends in through the period.